As a student of leadership and a fan of basketball this post by Scott Williams resonated with me. Regardless if you are a basketball fan or not, Phil Jackson's legendary career, both as a coach and a leader, is worth examining. Check it out. 1. Willingness To Coach The Best: Phil wasn't scared of coaching the best and showed them how to be even better. His leadership brought out the legendary best from the likes of Michael Jordan, Shaquille O’Neal and Kobe Bryant. Great leaders take on the best, and build a great supporting cast around them. That's how championships are won. 2. Win Without The Coach: Phil prepared his teams in a manner that allowed them to believe in themselves and get it done without his direct supervision. He taught his team how to play through long stretches without timeouts or his direct interaction. He schooled his players more than just execution; he made them great leaders and confident thinkers. Great leaders prepare teams to perform at a high-level, even in the leader's absence. 3. Mastered The 3-Peat: Phil was able to “3-Peat” several times with several teams. He not only won championships, but he did it again and again and again. The one time he didn’t 3-Peat, he just repeated again. He even said it in his closing press conference upon his retirement, that the thrill of chasing the “3-Peat” is always a great challenge. Great leaders don’t want their teams to just win, but to win again and again. 4. Created A Culture Of Winning: Creating a culture of winning comes with extreme give-and-take, strategy, encouragement, and believing in those you lead. It requires taking the best basketball players on the globe, and meshing them role players and players with quirky personalities like Dennis Rodman and Ron Artest. He created a culture of focused chemistry that made all players valuable and maximized potential in everyone. The number-one priority in coaching--and leading--is to create a strong team culture by developing leadership, empowerment, communication, authentic care for others, relationships, trust, and motivation. 5. 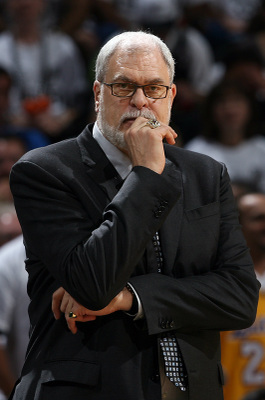 Cool, Calm and Collected: Phil Jackson was one of the most calm and collected coaches in the game. He would sit on the sidelines, as cool as the other side of the pillow, even under immense pressure. This translated to his team taking on that same persona. Teams feed off of their leader; if their leader demonstrates a “we got this” mentality, it’s destined to rub off on the players. 6. He Knows When It’s His Time: Phil retired into the sunset of Montana to relax for a season. He stated that he has had a good 20-year run of coaching, and now it’s time to give some of the younger coaches an opportunity. Some leaders don’t know when theirtime has passed, and they make it rough on an entire organization. It’s important to remember, just because you take a pause, a rest, a vacation, or a sabbatical doesn’tmean that you might not have one more run in you at a later date. Know your time. Know your seasons.